This exhibit at the Hardin Library for the Health Sciences (3rd floor) highlights eleven instances of human experimentation from 1796 to 2013. Displays include early experiments on digestion and X-rays; WWII experiments by the Nazis and Japanese; and experiments for the Manhattan Project, Atomic Energy Commission, and Holmesburg Prison. In anticipation of Bill Morrison’s visit to the University of Iowa, March 1-3, as part of the UI Provost’s Global Forum International Programs and Obermann Humanities Symposium, the Department of Cinematic Arts is hosting a screening series of a selection of Morrison’s short films. On February 28, the Department will screen Ghost Trip (2000; 23 min), City Walk (1999; 6 min), Outerborough (2005; 9 min), Who By Water (2007; 18 min), and Re:Awakenings (2013; 18 min). “Against Amnesia” guest scholar Debora Matthews will be giving a speech to the Iowa City Foreign Relations Council from 12:00 to 1:15 p.m. A locally catered lunch is available for purchase. The Iowa City Foreign Relations Council is located at 1120 University Capitol Center within the offices of UI International Programs. In anticipation of Bill Morrison’s visit to the University of Iowa, March 1-3, as part of the UI Provost’s Global Forum International Programs and Obermann Humanities Symposium, the Department of Cinematic Arts is hosting a screening series of a selection of Morrison’s short films. On February 21, the Department will screen The Miners’ Hymns (2011; 52 min) and Highwater Trilogy (2006; 31 min). WorldCanvass invites you to join us at MERGE, 136 South Dubuque Street, for season nine of International Programs’ unique, internationally focused discussions. Live programs take place from 5:30-7:00 p.m., and the shows are free and open to the public. Don’t miss the catered reception from 5:00-5:30! For photos, audio, and transcripts of this event, visit WorldCanvass Recap. University of Iowa Museum of Natural History, 11 Macbride Hall, 17 N. Clinton St.
Each of the sites will feature short talks, “behind the scenes” tours, and tables with handouts and hands-on activities…including a “mystery objects” contest with prizes! Free and open to the public. This two-day symposium and exhibition at the UI Museum of Art will celebrate the history of Dada and “neo-Dada”/Fluxus on campus. The symposium seeks to highlight how museums, libraries, universities, and the general public have shaped our understanding of avant-garde movements. Through a hybrid format of keynote addresses, themed panels, film screenings, and group discussions held on campus and in downtown Iowa City, this meeting will consider the power of interdisciplinary art and research evident in our past and aim to develop the practices that will sustain its future on campus and beyond. FilmScene will be screening this new, award-winning documentary by Frederick Wiseman on Saturday, 2/17, at 10:00 a.m. Run time is 3 hours, 17 minutes. An exhibition featuring 25 of the more than 1200 collections in the Iowa Women’s Archives as seen by those who have used them. Iowa screenings of Saving Brinton, an enchanting 90-minute documentary that tells the story of a collection of 130 early nitrate films—including two once believed to be lost by the great French illusionist and pioneering filmmaker Georges Méliès—and the rural Iowan who discovered them and saved them from oblivion. For the dates, locations, and tickets for each screening, visit http://brintonfilm.com/screenings/. Participants will gather in the Iowa Women’s Archives to renew old friendships, explore the exhibition 25 Collections for 25 Years: Selections from the Iowa Women’s Archives, and reflect on the ways in which the collections of the Iowa Women’s Archives have enriched teaching and research over the past quarter century. View the full schedule at the link above. Dates and times: Feb. 27–April 17, Tuesdays, 2:00 p.m.–3:50 p.m. This course will examine emerging human rights issues from an interdisciplinary and international perspective. Students will visit campus archives for hands-on exploration of the UI’s many treasures. Dates and times: Feb. 1–March 8, Thursdays, 5:00 p.m.–6:30 p.m. The class will meet four times for 90 minutes before the conference and one time for 90 minutes afterward. Because the symposium is the heart of the course, attendance at the symposium is required. Off-cycle meeting times: 5:00 p.m.–6:30 p.m. on the following dates: 2/1, 2/8, 2/15, 2/22, 3/8. 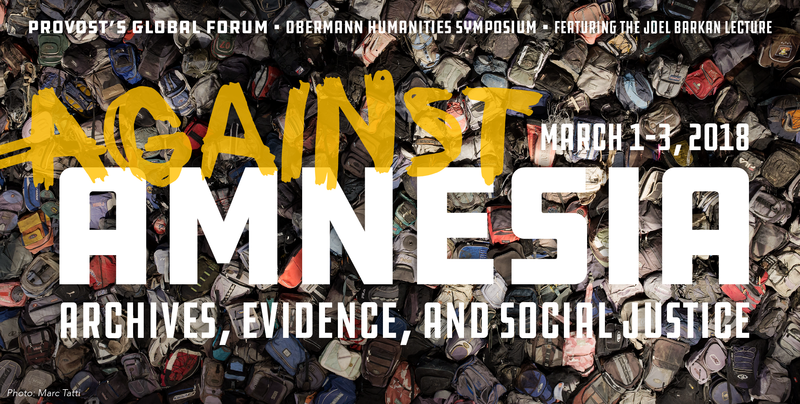 This course is designed to prepare graduate students from any discipline who plan to attend the 2018 Obermann Humanities Symposium. The class will offer a cross-disciplinary introduction to current discussions of archives, archival practices, and archival thinking. This seminar surveys the history and theory of archiving across print and audiovisual technologies, then focuses on the challenges to archiving in the age of digital media. Students will investigate the impact of digital archives across media, disciplines, archiving practices, and current debates, including the rise of the digital humanities, new media theory, philosophy of memory, copyright battles, ethics, and access.